Gdynia is a relatively young city born out of the Treaty of Versailles in 1919. The League of Nations decision to create the Free City of Gdansk (Danzig) which incorporated Sopot (Zoppot) and left neighbouring Gdynia in the newly reformed Polish state and at the end of the infamous Polish corridor – the narrow strip of land granted to Poland to give it access to the sea. What had, up until then, been a quiet fishing village with a handful of permanent residents soon became the focus of huge development as Poland created a massive port facility to rival that of the German controlled Gdansk. Construction began on May 21, 1921 and within 5 years a new city and major port had been created. While it lacks the 1,000 year history of its better known neighbour, Gdynia is a wonderful example of a 20th century city with its construction covering the Art Deco period of the 20s and 30s, the Socialist era of post-war Europe and the modern designs of the post-communist Poland. The city can offer beautiful beaches and walks, some of the best restaurants and nightlife in the Tri-city as well as a small but decent selection of hotels and contains a fiercely proud population still shaped by the time not so long ago when Gdynia was viewed as the true Polish city on the coast. To keep abreast of what's happening in the Tri-city, follow our blog and find us on Facebook, Twitter, Instagram and Tumblr. 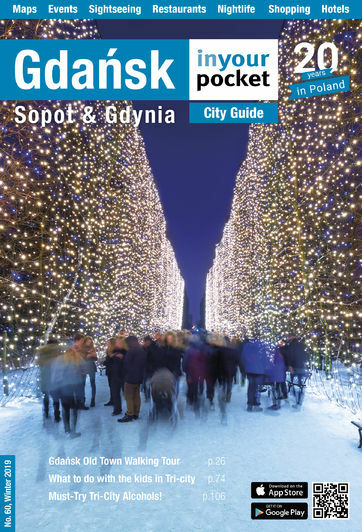 We'd be delighted to hear your thoughts on the city and the guide so feel welcome to drop us a line at poland (at) inyourpocket.com.